I’m spending the 2018-2019 academic year as a fellow at the Center for Advanced Study in the Behavioral Sciences (CASBS) at Stanford. 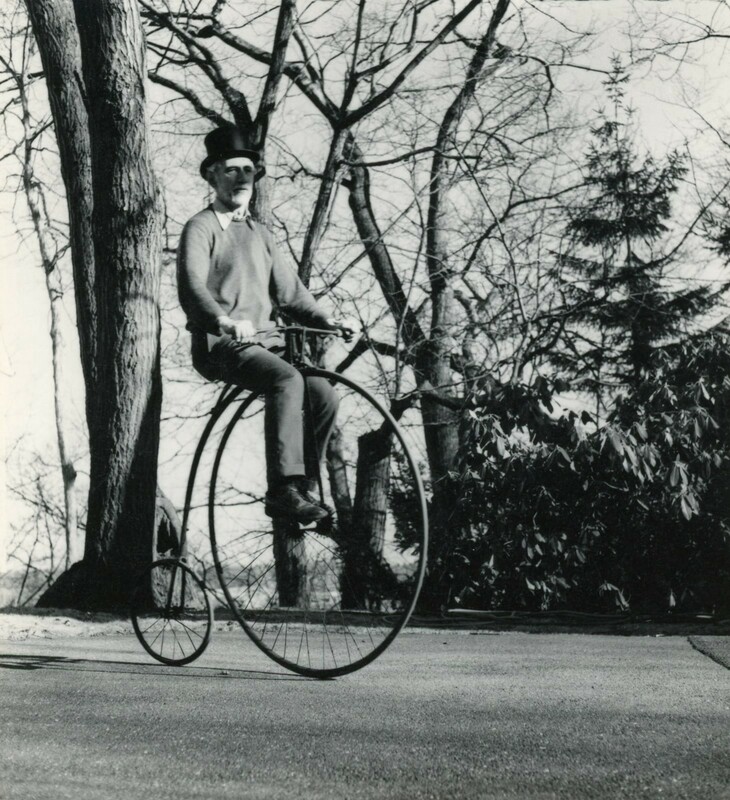 Claude Shannon on a bicycle. 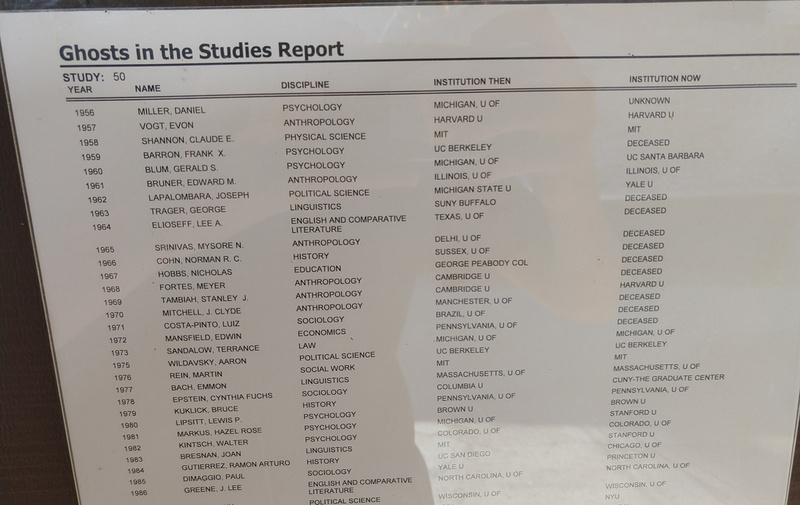 Every CASBS study is labeled with a list of “ghosts” who previously occupied the study. This year, I’m spending the year in Study 50 where I’m haunted by an incredible cast that includes many people whose scholarship has influenced and inspired me. The top part of the list of ghosts in Study #50 at CASBS. Rarely does it happen in mathematics that a new discipline achieves the character of a mature and developed scientific theory in the first investigation devoted to it…So it was with information theory after the work of Shannon. As someone whose own research is seeking to advance computation and mathematical study of communication, I find it incredibly propitious to be sharing a study with Shannon. Although I teach in a communication department, I know Shannon from my background in computing. I’ve always found it curious that, despite the fact Shannon’s 1948 paper is almost certainly the most important single thing ever published with the word “communication” in its title, Shannon is rarely taught in communication curricula is sometimes completely unknown to communication scholars. In establishing itself under the banner of communication, the discipline staked an academic claim to the entire field of communication theory and research—a very big claim indeed, since communication had already been widely studied and theorized. Peters writes that communication research became “an intellectual Taiwan-claiming to be all of China when, in fact, it was isolated on a small island” (p. 545). Perhaps the most egregious case involved Shannon’s mathematical theory of information (Shannon & Weaver, 1948), which communication scholars touted as evidence of their field’s potential scientific status even though they had nothing whatever to do with creating it, often poorly understood it, and seldom found any real use for it in their research. In preparation for moving into Study 50, I read a new biography of Shannon by Jimmy Soni and Rob Goodman and was excited to find that Craig—although accurately describing many communication scholars’ lack of familiarity—almost certainly understated the importance of Shannon to communication scholarship. For example, the book form of Shannon’s 1948 article was published by University Illinois on the urging of and editorial supervision of Wilbur Schramm (one of the founders of modern mass communication scholarship) who was a major proponent of Shannon’s work. Everett Rogers (another giant in communication) devotes a chapter of his “History of Communication Studies”² to Shannon and to tracing his impact in communication. Both Schramm and Rogers built on Shannon in parts of their own work. Shannon has had an enormous impact, it turns out, in several subareas of communication research (e.g., attempts to model communication processes). Although I find these connections exciting. My own research—like most of the rest of communication—is far from the substance of technical communication processes at the center of Shannon’s own work. In this sense, it can be a challenge to explain to my colleagues in communication—and to my fellow CASBS fellows—why I’m so excited to be sharing a space with Shannon this year. Shannon’s work is both mathematically beautiful and incredibly useful. His seminal 1948 article points to concrete ways that his theory can be useful in communication engineering including in compression, error correcting codes, and cryptography. Shannon’s focus on research that pushes forward the most basic type of basic research while remaining dedicated to developing solutions to real problems is a rare trait that I want to feature in my own scholarship. Shannon was incredibly playful. Shannon played games, juggled constantly, and was always seeking to teach others to do so. He tinkered, rode unicycles, built a flame-throwing trumpet, and so on. With Marvin Minsky, he invented the “ultimate machine”—a machine that’s only function is to turn itself off—which he kept on his desk. A version of the Shannon’s “ultimate machine” that is sitting on my desk at CASBS. I have no misapprehension that I will accomplish anything like Shannon’s greatest intellectual achievements during my year at CASBS. I do hope to be inspired by Shannon’s creativity, focus on impact, and playfulness. In my own little ways, I hope to build something at CASBS that will advance mathematical and computational theory in communication in ways that Shannon might have appreciated. Incredibly, the year that Shannon was in Study 50, his neighbor in Study 51 was Milton Friedman. Two thoughts: (i) Can you imagine?! (ii) I definitely chose the right study! Rogers book was written, I found out, during his own stint at CASBS. Alas, it was not written in Study 50.